Much of Hammer’s story before he came to WOLF’s attention in 2006 is a mystery. Whether he was born at the facility we rescued him from, brought in from elsewhere, used for breeding or intended to be sold, we have no idea. What we do know is when we rescued him he was approximately 9 years old, weighed 50 lbs and tested heartworm positive. His ears where frostbitten and torn, there were problems with his hips; and he avoided contact with people whenever possible. Unable to bring him or his 17 companions directly to WOLF due to space constraints at the main facility, he was taken to a foster location. There volunteers worked to reverse the damage done to him in his previous life. He was eventually paired with a female named Gina, who was most likely a sibling. Together they made outstanding progress; gaining weight, winning out over the heartworm and slowly coming around toward humans. By 2008 events occurred that made it necessary to bring the remaining animals from the foster facility to WOLF. Hammer and Gina arrived in early October. While the move was hurried and traumatic, it didn’t set Hammer back and he continued to grow healthier and more social. Emboldened by Gina’s commanding personality, you would often see them together arguing with their neighbors or watching intently when someone came into the enclosure with treats. 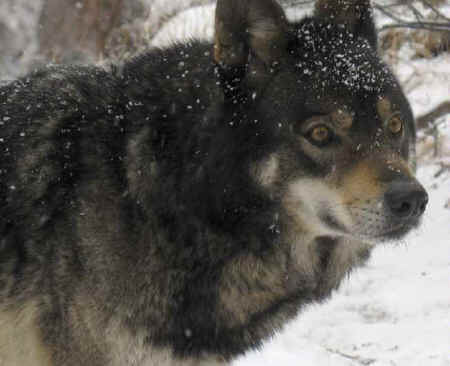 When Gina passed in 2009, Hammer mourned for days, often howling while the other wolves remained silent. While he missed Gina, we knew we could not leave Hammer alone and it was eventually decided to place him with Mucqua and Kasota. He adjusted well under Kasota’s gentle care and continued developing a shy but happy-go-lucky attitude toward life. Always eager for a treat, he could easily charm you out of a can of wet food when he was out of his doghouse with his eager bounce and an unmistakably happy expression on his face. As he grew older his arthritis became progressively worse, making him less and less willing to leave his doghouse. We started him on a regimen of anti-inflammatory and mild pain meds to help him manage. On September 27th, volunteers noticed he was unable to get his back end up and an appointment was made to bring him to the vet. He was diagnosed with degenerative myelopathy. There is no treatment for this disease other than pain management, but Hammer was bright, alert and happy so we brought him home. We helped him around his enclosure and brought him food and water while we waited for a sign from Hammer telling us he was ready to go. On October 1st he started losing his ability to use his front legs and his eyes had lost their brightness. He was helped to pass peacefully that afternoon. It is interesting there was exactly two years and one day between Gina and Hammer’s passing and that they both suffered from the same illness. Though Hammer’s goofy antics will be greatly missed we are comforted by the fact that he is once again with Gina.